"It's hard to believe it's been fifteen years since the release of the Six album. People still talk to me about it. It sort of follows me around, and I guess it always will. I'm forever answering questions about the production, the lyrics, the arrangements, the meaning of it all. I only have half of the answers because it meant one thing to me, but another thing to the other maker of the record who was the guitarist in Mansun, whose take on the number six was to do with Taoism, Winnie The Pooh, a book called Now We are Six and a load of stuff I don't really know about. For my half, Six meant No. 6: the lead character's name in The Prisoner, a TV show and an obsession of mine since I was about 10 years old when I visited a magical place, not too far from where I grew up, called Portmeirion. This is the Italianate village in North Wales where Patrick McGoohan's (the show's star and co-creator) tour de force was conceived and filmed. This is the Sixties TV show around which I based one of my records, Six. Absurd, but true. I think it's fair to say Portmeirion is my favourite place in the world, other worldly and stunningly beautiful. Built by Sir Clough Williams-Ellis, starting in 1925 and still being amended as recently as 1975, the place is a must see even if you're not a fan of the TV show, and if you're not, buy the box set and become a fan now! The Prisoner was an idea formed by Patrick McGoohan when he visited the village of Portmeirion in North Wales. Having already starred in a Sixties TV show Danger Man, about a British secret agent - James Bond in style if you like - The Prisoner vaguely picks up the story of the character in Danger Man, John Drake, as he resigns his post as a British secret agent and is subsequently abducted and finds himself in a place called 'The Village' where he is subjected to various methods of mental and physical manipulation over the course of the series to find out exactly why he resigned his post. After visiting Portmeirion as a child, and with The Prisoner gaining cult status after its initial run on British and US TV in the Sixties, the newly formed TV station Channel 4 decided to re-run the show in the early Eighties. That's when I first saw and devoured the TV show and subsequently went on to make Six, with the album exploring lyrically some of the themes of the TV show - no conformity and being an outsider in society. I used some of the imagery from the show in the album's artwork. If you have the record, go and have a look. There's the chessboard from the episode 'Checkmate' on the front cover. There's No.2 (a character from the show) in his Sixties-style chair. There's No.6 himself, there's the symbol of the whole show, the penny farthing bicycle in a stained glass window on the front cover, and there's even the spokes from the penny farthing on the body of the CD itself. The penny farthing in the show represents the progress of humanity and questioning if it's a good thing or not. It's seen around the village from time to time and appears in the closing titles of the show. I allude to the penny-farthing in the song 'Six' at the start of the album where I'm going on about being "safe from progress". 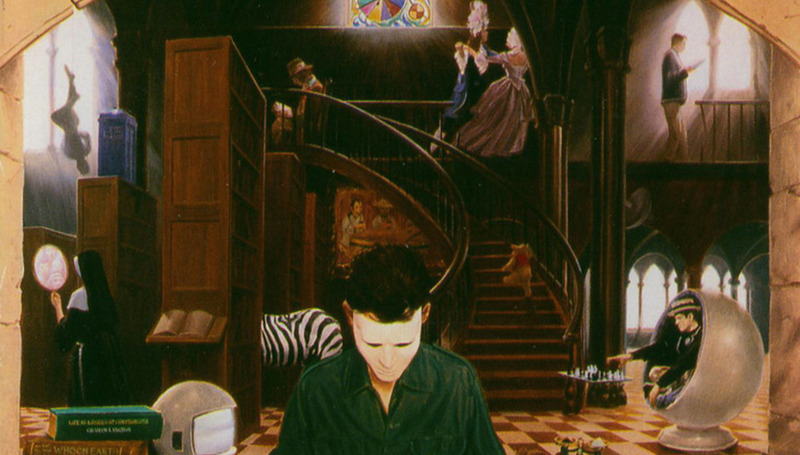 Also, on the artwork for the album is a book entitled The Schitzoid Man which refers to my favourite episode of The Prisoner where a doppleganger for No. 6 called '12' is brought in for the episode and they fight for the right to see who is the real No. 6. The actual village of Portmeirion is the backdrop for the TV show with many of the buildings and monuments in Portmeirion serving as the sets; the Stone Boat, No. 2's house - The Green Dome, No. 6's house, the hospital, the chess board, the beach. If you've ever been to Portmeirion you'll know them all. It's funny, The Prisoner and the album Six are like pebbles that have been dropped into the ocean; not really noticed at the time, but the ripples of that pebble can go on and on. You must have done something where the ripples of that pebble can be felt for years, even decades to come, haven't you, yes, you? Getting paranoid? Well go and watch The Prisoner, it's a masterclass in paranoia itself! I guess like Patrick McGoohan having starred in Danger Man then wanting to do something more creative with The Prisoner, ultimately I was trying to be artistic as opposed to commercial on the Six record and tapped into the whole mythology of Portmeirion, No. 6, The Prisoner etc. They put me in the Wrexham Art School prospectus after the Six album.